Many Book of Mormon texts mention various metals. 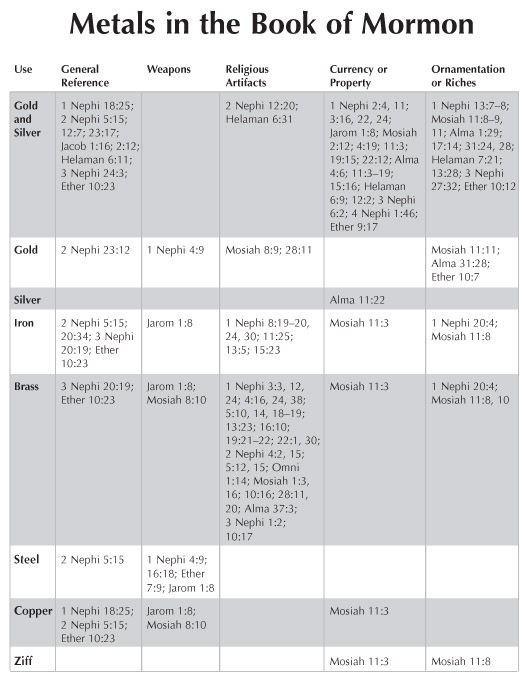 This chart lists the types of metal that the Nephites, Lamanites, and/or Jaredites knew from their scriptures or found in the Americas. These references are grouped according to the use of the metal in each case. Brass (especially in connection with the plates of brass) is mentioned most often in religious contexts, while gold and silver (often mentioned together) were used largely in commerce or for ornamentation.